The Glenanne Gang was a state-backed terrorist group which operated in the United Kingdom’s embattled legacy colony on the island of Ireland during the 1970s, the earliest part of the so-called Irish-British Troubles. Composed of serving and former members of the UK Armed Forces – notably the Ulster Defence Regiment (UDR), a locally raised militia – and the Royal Ulster Constabulary (RUC), Britain’s counterinsurgency police force in the disputed region, the covert group gained notoriety for the unprecedented savagery of its attacks against the northern nationalist or pro-Dublin civilian population during the prolonged era of anti-colonial and communal strife. Primarily based at a farm of the same name near the village of Markethill, County Armagh, which was owned by a prominent local RUC man, the gang killed at least 120 Irish men, women and children and injured scores of others in a decade of gun and bomb attacks, forming a nominal partnership with the Ulster Volunteer Force (UVF), a pro-London or loyalist terror organisation. At the height of its bloody power, the gunmen succeeded in turning a significant part of the mid-Ulster counties of Armagh and Tyrone into a lawless zone dubbed the “Murder Triangle” by the domestic and international press. Eventually the reckless nature of the Glenanne Gang became its undoing as those members of the British Forces colluding with the group, specifically senior officers of the RUC Special Branch, the Intelligence Corps and the Security Service (the SS, though better known by the acronym, MI5) began to lose their grip on the operational direction of the soldiers-turned-terrorists. By 1981, a majority of the militants were out of action or had lost access to the military, intelligence and governmental resources of the United Kingdom. Instead, the focus of Britain’s counterinsurgency campaign in Ireland, its Dirty War against the guerrillas of the Irish Republican Army and the political activists of Sinn Féin, shifted to tightly controlled allies in other loyalist factions, particularly through the clandestine work of the Force Research Unit (FRU), a British Army death squad which instigated the 1989 assassination of Pat Finucane, a prominent human rights lawyer in Belfast and a stern critic of the UK’s draconian policies in the north-eastern Six Counties. A new documentary, Unquiet Graves: The Story of the Glenanne Gang, by the filmmaker Seán Murray, is due for a release in September of this year. Based in part upon the definitive history of the state-sponsored terrorist organisation, Lethal Allies: British Collusion in Ireland, written by the respected journalist Anne Cadwallader, the film hopes to give voice to the grief and sense of injustice felt by the families of the Gang’s many innocent victims. It also seeks to address the realities of Britain’s murky war in Ireland during the Troubles of 1966 to 2005, a conflict which ended with London acknowledging the existence of a military stalemate in the occupied territory and the need for a compromise peace with its Irish republican opponents after three decades of futile fighting. The Close Observation Platoon in action (at least that’s what they look like – unless the pic is from some silly movie)? These were allegedly regular troops with SAS training, but are rumored to have been SAS staged in regular troop assignments. They were the only ones with the M16 as a standard issue weapon. Strange to see two radio men in such close proximity of each other and directly exposed to potential threats. From what I hear, they were particularly unfriendly. The photo is an original, December 1985 Armagh. I’m not sure if is a COP. 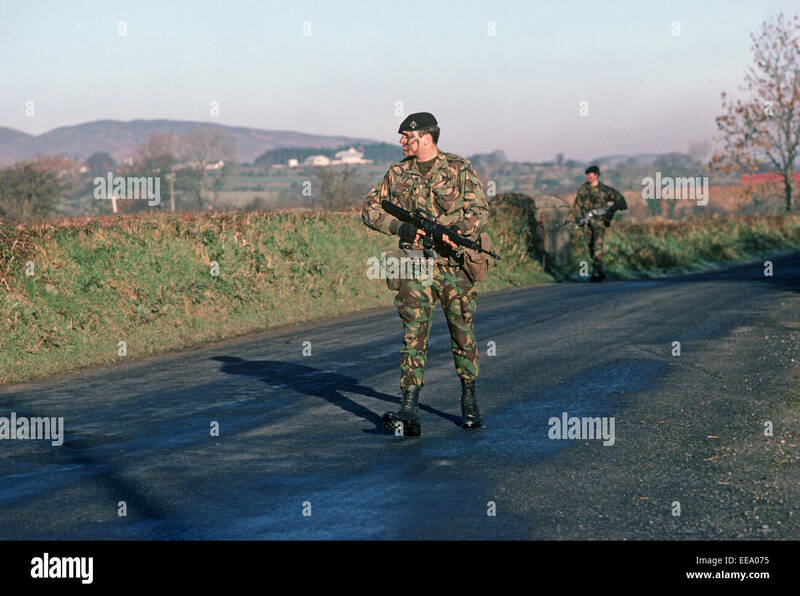 Different British units were using M16s where and when needed at this time because they were still outgunned by the IRA’s own M16s/AR15s, H&Ks etc. (even though the BA’s L1A1s had a longer range and were in the hands of trained soldiers). This was esp. true along the border, where the Para, Marines etc would occasionally appear with them. Then the SA80 came into service and the L1A1 and M16s were largely stored away. Though the SA80 very quickly turned out to be a design disaster! I can’t make out the unit badge here. Cadwallader’s reputation took a hiding when she allied herself to Peter Jukes. FRU? Linked to Ian “Walter Mitty” Hurst. Unfriendly? One heard that lowland Scots were the worst, or Royal Marine Commandos.